Today, redbankgreen wraps up its Cool Inside series (yes, we’re early; see below for explanation). But we’re going out with a bang, literally putting a cherry on top with a visit to Cherry On Top in Sea Bright. “A good space with friendly energy,” the Sledger says. Today’s Star-Ledger reviews the Bistro at Red Bank, and finds that the Broad Street eatery manages to pull off an eclectic menu while adding “an effervescent buzz” to the downtown. Parked on an easel in the sunlit second-floor studio on the east end of Red Bank, a painting is taking shape, almost in turn-of-the-seasons real time; brashly delineated trees sprouting like declarative statements from the thrill-ride curves of a crazy quilt countryscape. What might have been the makings of some plein-air jigsaw puzzle in less imaginative hands is becoming, under the artist’s patient eye and brush, a ruckus of bold shapes and colors  a scene in which Nature’s delightfully messy-thorny-scratchy surprises lurk beneath those curvaceous comforts. Just don’t ask about a title for the canvas, at least not yet. To Evelyn Leavens, the name “Work in Progress” will suit it just fine. In fact, to hear the 85-year-old painter, photographer and instructor tell it, her 60-year career is still just that  a work in progress. With a major solo exhibit of her paintings on display now at the Monmouth Museum in Lincroft  as well as a contribution to a much-anticipated group show opening this weekend at Shrewsbury’s Guild of Creative Art  the work of the locally legendary Leavens has never been more visible and accessible. Still, the artist herself would prefer not to call it a “retrospective.” Think of it as a chance for Leavens to pause for one moment  a moment in which the rest of us can struggle to catch up  before sprinting ahead to the next challenge. For nearly four years, Rumson officials and its police union have been at loggerheads on a new contract. Earlier this week, a state arbitrator delivered a decision that has the council shocked and disappointed. The governing body will appeal the decision given by arbitrator James Mastriani, said Mayor John Ekdahl. The terms Mastriani proposed, he said, create a “privileged class” of employees. The award calls for 3.5-, 3.5- and 3.25-percent pay increases retroactive to when the union’s contract expired at the end of 2006. For 2010, officers would get increases of 3 percent, and 2.75-percent next year if Mastriani’s award holds up. But given the state’s economic turmoil  plus a pending 2-percent tax cap  Ekdahl finds the terms of the police contract unfair to the borough and its taxpayers. A crowd that spilled over onto the Monmouth Street sidewalk packed the courtyard of the Dublin House Pub Wednesday night for the second alfresco fashion show held there in three months. Like the last one, held in April, this one was organized by Rosa Davis of Bella Mystique on Broad Street. It also again featured amateur models from in and around Red Bank, and was supported by local hairdressers, modeling advisors and makeup artists. A series of raffles raised money for Lunch Break, the soup kitchen on the West Side. But even with the parochial slant, the event had the frisson and throb of its more urbane counterparts. redbankgreen photog Peter Lindner was there with his gear to capture it all in pixels. Last week’s ‘Where’ featured a photo of a gyroscopy sorta thigamajig. We don’t know what it’s called, but omnidirectional Wheregulars Tim Lake and Sandra Talarico GPSed it correctly. The much-anticipated return to Red Bank of vegan restaurateurs Gail Doherty and Tiffany Betts is complete. Months later than they’d hoped, the pair quietly opened the doors to their new eatery, Good Karma Café, at 4p Wednesday, and quickly found themselves hustling up orders for a half-dozen hungry customers. Last week, redbankgreen reported that a Monmouth County architect had met recently with historic preservation advocates in Red Bank about building a four-unit condo project on a vacant lot at the corner of East Front and Washington streets. The meeting was a courtesy call of sorts. Brendan McHugh, a Manasquan-based architect working for an unidentified prospective buyer and developer of the site, sat down with members of the boroughs Historic Preservation Commission to give them a heads-up and get early feedback on the plan. He hadn’t, and still hasn’t, filed any formal proposal with the town. The commission plays an advisory role in land use issues involving properties in the Washington Street Historic District, and the lot McHugh was targeting was in the zone. Or so everyone at the meeting thought. Recession-pinched consumers: this is your weekend. The 56th annual edition of the Red Bank Sidewalk Sale opens Friday and runs through Sunday. Racks and tables laden with clothing, footwear, housewares and other merch will offer up a smorgasbord of deals along Broad, Front, Mechanic, White, Wallace and Monmouth Streets, as well as Linden Place and Wharf Avenue. A 19-year-old Fair Haven man was in custody after admitting to a spree of burglaries early Tuesday morning in Colts Neck and Tinton Falls, according to the Asbury Park Press. In addition, Carl Vonpier faces a charge of false reporting after telling Colts Neck police that he’d been forced at gunpoint to participate in a break-in at the Colts Neck Shopping Center, where cops had caught him with tools and a fake gun. His claim triggered a manhunt  one involving a helicopter and search dogs  for a suspect who, police say did not exist according to the Press account. Somehow, little old Red Bank survived its first century-plus of existence without an outdoor fashion show featuring skimpily clad amateur models. Rosa Davis of Bella Mystique filled that cultural void with panache on a chilly night back in April. That’s when several dozen customers of her Broad Street boutique strutted a red carpet laid down outside the Dublin House on Monmouth Street. The place was packed, the music was throbbing, and there was enough jiggle in the courtyard to boost the ambient temperature by a couple of degrees. So why wait another century to do it again? Even if the temperatures are now tropical quality. A stretch of Front Street in Red Bank is slated for design changes aimed at improving pedestrian and biker safety, according to a planning group that doles out federal funds for transportation projects. The North Jersey Transportation Planning Authority says it plans to spend about $500,000 to make the “Front Street/River Road corridor” safer through the installation of new sidewalk and crosswalk configurations and other devices. An announcement by the NJTPA, which serves as a metropolitan planning authority for 13 New Jersey counties, including Monmouth County, does not specify where along the corridor the improvements will take place, or when. A call to an agency spokesman was not immediately returned Tuesday morning. But Monmouth County Freeholder John D’Amico is quoted in the announcement as calling out the stretch in the area of Riverview Medical Center. A proposal to increase the number of taxis allowed to operate in town and to hike the license fees has Red Bank hacks riled up. About a dozen taxi drivers and dispatchers who believe the current rules work just fine came to take up a few rows in the council chambers Monday night, when the ordinance change was introduced. The council had decided to amend the ordinance to curb what it sees as a hording problem in which larger companies buy and sit on licenses without using them, thereby squeezing out competition. That just isn’t the case, says Gary Damanti, who represents Red Bank Yellow Car Company. “I think a lot of the steps in this ordinance really address problems that don’t exist,” he said. Red Bank’s borough council is ready to go beak-to-beak with a chicken-wing business it says is marring municipally-owned property with advertising. Councilman Michael DuPont said he’s noticed that since the council raised the issue back in May, when Mayor Pasquale Menna raised the idea of fining businesses for having stickers on borough property, more stickers have shown up on signs in town. A prominent offender, DuPont said, is Cluck-U Chicken, of the City Centre strip mall on Water Street. “Cluck-U Chicken has desecrated our signs,” DuPont said. Remember the summer of 2009? When it rained the entire month of June? Or how about the repeated snowstorms that got dumped on us this past winter? Well, it may be hot now, but for beach lovers and boaters, the summer of 2010 is shaping up as a smactacular bonanza. That was in full evidence in the tiny burg of Sea Bright this weekend. Photographer Peter Linder wandered the streets and strands of Sea Bright for redbankgreen on Saturday, and this is what he saw. And we get to enjoy it all over again! Stung by the way it says it has been characterized recently, the Jersey Shore Jazz & Blues Foundation has taken to the media to trumpet its virtues and push back against claims that it “hijacked” an event that began as a showcase for Red Bank restaurants. In the wake of a decision last month by borough restaurateurs and local officials to revive Riverfest, the predecessor event to the former Red Bank Jazz & Blues Festival, foundation officials say in a letter distributed to news outlets that they didn’t know they were in a conflict until they read claims that Riverfest proponents had “won” the battle between the two. 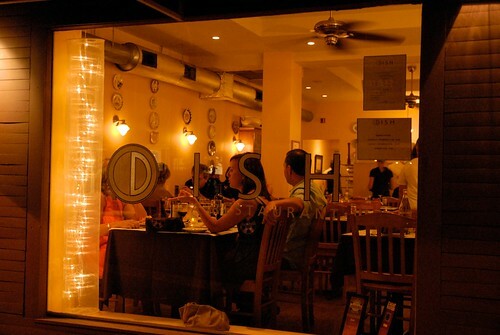 Dish, a restaurant on White Street in Red Bank, scored a positive review in the Metropolitan section of the New York Times Sunday. Food critic Karla Cook, however, had some issues with the ventilation system and a door chime. A Red Bank man and his cousin from Sea Bright drowned at Sandy Hook’s Gateway National Park Saturday, and the Red Bank man’s brother was in critical condition after attempting a rescue, the Asbury Park Press and the Star-Ledger reported over the weekend. The Sledger reports that Miguel Angel Romero-Leon, 30, of Red Bank, died after trying to save Gonzalo Romero-Tlamintzi, 33, of Sea Bright, who also died in the waters off Plum Island, a sandbar on the bay side of the Sandy Hook peninsula. They were taken to Monmouth Medical Center where they were pronounced dead after the 4:30p incident. Romero-Tlamanintzi’s brother, Martin Romero, 30, of Red Bank, remained in intensive care Sunday after bystanders Bobby James of Woodbridge and Howard Morris of Columbus, Ohio, brought him to safety, National Park Service spokesman John Warren told the Press. “I know bystanders performed CPR on him,” Warren said. The crime reports below were provided by the Red Bank Police Department for the week of July 16 to July 23, 2010. The information appears here unedited. Theft occurring 7-16-10 at Madison Ave. Victim reported that unknown person(s) stole a bicycle described as a Fuse BMX boy’s style bike, gold in color from the back yard of residence. Ptl. Gary Watson. Criminal Mischief occurring on 7-17-10 at Riverside Ave.. Three unknown juvenile males pushed a cart located behind building off the dock and into the water. Ptl. Thomas Doremus. Theft occurring on 7-17-10 at Shrewsbury Ave. Victim reported that unknown subject(s) stole his bike described as a silver Iron Horse Mountain bike. Ptl. Michael Zadlock. Oh man, Cool Inside has been hankering for this one all summer long. We’re talking classic milkshake, made to perfection, and served up at the pink Formica counter of gleaming, chrome-sided diner redolent of postwar prosperity and optimism. Students in the two-school Red Bank school district will be required to wear similar clothing, but not uniforms, starting in October, the Asbury Park Press reports. The policy stops short of mandating identical outfits of the kind worn in parochial schools. A vacant lot in Red Bank’s historic district could become the site of townhouse-style condos if informal plans now in the works gel. Brendan McHugh, a Manasquan-based architect, has drawn up plans for a four-unit project at the corner of East Front and Washington streets, and recently made an informal pitch about his plans to the borough’s Historic Preservation Commission. Saturday nights have been hopping in downtown Red Bank of late, so redbankgreen dispatched photographer Peter Lindner to the streets and bars last Saturday to capture the post-sundown vibe. He filed this set of 102 shots, from the couple enjoying a quiet dinner to the guys and gals on the prowl to to the folks who make it all happen in an orderly, law-abiding sort of way. Enjoy! A collective groan was heard through downtown Red Bank earlier this month went a court-appointed official abruptly shut down Ashes Cigar Bar, a high-profile if controversial eatery and bar that served as a nightlife anchor for more than a decade. Just what we need when the retail and restaurant sectors are struggling to claw back to profitability, store owners said: a honking big vacancy in a town with plenty of small and medium-sized ones. How will the building’s owner find a tenant to replace Ashes in this economy? Well, landlord Jack Anderson doesn’t think the outlook is dire. He says he’s already got offers for the three-story building on his desk across the street at Jacks Music Shoppe, and he’s “motivated” to get a deal done ASAP. North, south, east, west: every Thursday (this being the 215th) Where Have I Seen This? showcases a detail of the world surrounding us. Today is no exception, as we present an outdoor feature waiting to be discovered. If you can identify its location, please drop us a line with the words Where Have I Seen This in the subject line.